Ok, I know, I know. I am super late on the chia seed pudding bandwagon! Those of you who are into #cleaneating #healthy #raw #vegan #whatever recipes, I'm sure, will be all over chia seed pudding - a quick Google search will yield hundreds of different recipes. 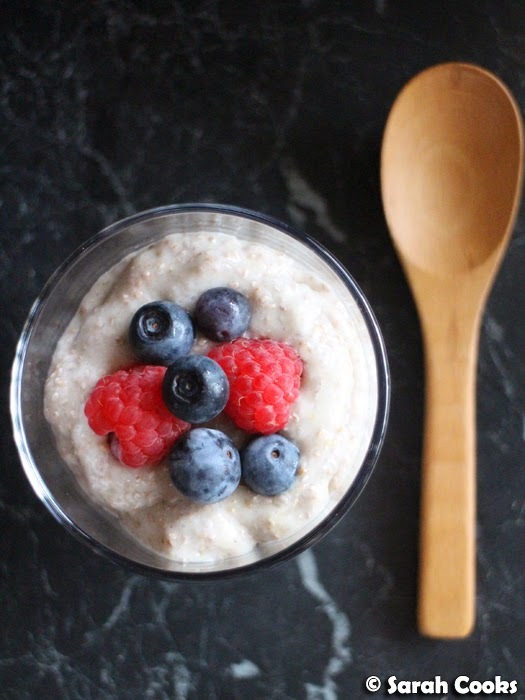 For me, however, it's only recently that I've really gotten into health-conscious cooking, and have found chia seed pudding to be a fantastic weekday breakfast. I don't like the blanket term "healthy" to describe food, but prefer to focus on its actual nutritional content, because you need to make your own informed decisions about what you want to put into your body, and no single food is inherently "healthy" or "unhealthy". Just because something is in the health food aisle or someone's tagged it with #cleaneating doesn't mean it is necessarily good for you, personally. Context is everything. How much of this food will you eat? What does the rest of your diet look like? Lifestyle factors are also hugely important. How active is your job? Do you exercise? What type and how often? Do you have any allergies or food intolerances? Vitamin deficiencies? High / low blood sugar? High cholesterol? (And these are just a few factors I can think of off the top of my head). For example, I love having slices of apple spread with peanut butter as a pre-gym snack, but if you have a peanut allergy then that would definitely be a no-no for you! When I was a teenager, the prevailing wisdom was that anything low in fat was considered "healthy", and I knew people who would eat a packet of white pita breads for lunch with nothing else, because it had that 98% fat free label on it. Low in fat? Yes. Healthy? Hardly. In my experience, the people who obsess the most about "healthy" food are the ones who have the least healthy relationship with food. (And I say this as a reformed dieter!) So these days, whenever I write about health-conscious or nourishing recipes, I try to talk about what you gain from them - fibre, vitamins, happiness - rather than simply telling you they're "healthy". And now... back to the recipe. I'm not entirely new to chia seeds, having made chia seed pancakes before, and having used them in my Gold Bar banana bread, but I never really got into the habit of using them regularly, despite knowing their status as a nutritional powerhouse. It was only recently, when I was looking for fast and nutritious breakfasts, that I learned that they could be used as the base ingredient for a pudding, rather than just being sprinkled into other things. 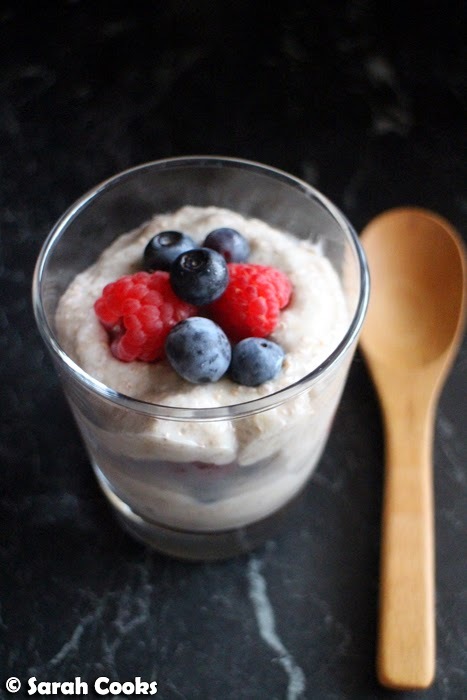 The pudding is very easy to make, and fits easily into my morning routine - chia seed pudding is a favourite weekday breakfast now. I based my recipe on this one from Goodness Green as it seemed nice and simple, and adaptable to different flavour combos. 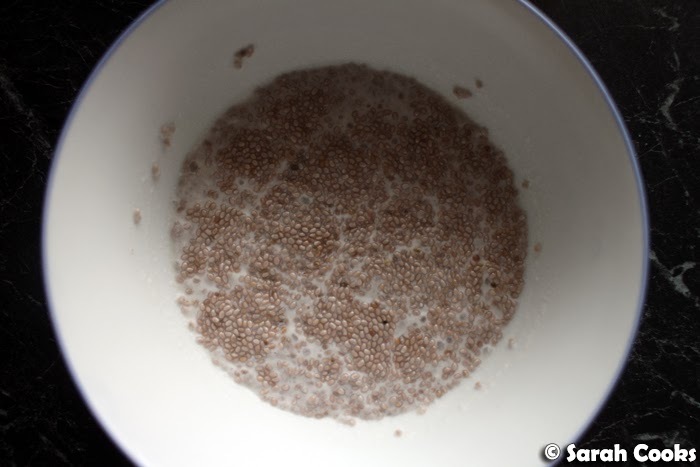 At its most basic, to make a chia seed pudding, you soak the chia seeds overnight in milk with a little liquid sweetener, after which time they will have absorbed the liquid and expanded into a kinda gloopy, jelly-like mixture. N.B. When I say "liquid sweetener", I mean something natural like honey, maple syrup or agave - no artificial sweeteners for me, thank-you! I'm well aware that honey, maple syrup and agave all have the same amount of fructose and calories as regular cane sugar, but I just can't do artificial sweeteners. I've tried stevia, which I'm told is the most "natural" sweetener and it has terrible side effects on me. Can't. Do. It. I prefer to have small amounts of natural sugars and just exercise more. This is the balance that sits best with me and fits into my lifestyle. As I wrote above, "Context is everything". One thing I did notice about a lot of the recipes online was that they suggest 1/4 cup (i.e. 4 tablespoons or 48 grams) of chia seeds for a single serving. I tried it this way the first time and it made the most gigantic bowl, it was ridiculous! I think 2 tablespoons of chia seeds makes a perfect-sized serving, but obviously scale up or down depending on your appetite. Importantly, it is very quick to prepare (about 1 minute the night before, and less than 5 minutes to blend and assemble in the morning) and is very light to eat - sometimes you want a good wholesome breakfast but can't face a large meal. And for me, layered up in a pretty glass with fresh berries, it feels like a real treat. Place the chia seeds, milk and liquid sweetener in a bowl and stir to combine. (Adjust the amount of sweetener depending on your tastes and how sweet your milk is). Cover with glad wrap and refrigerate overnight. When you are ready to eat, place the chia seed mixture into a blender. 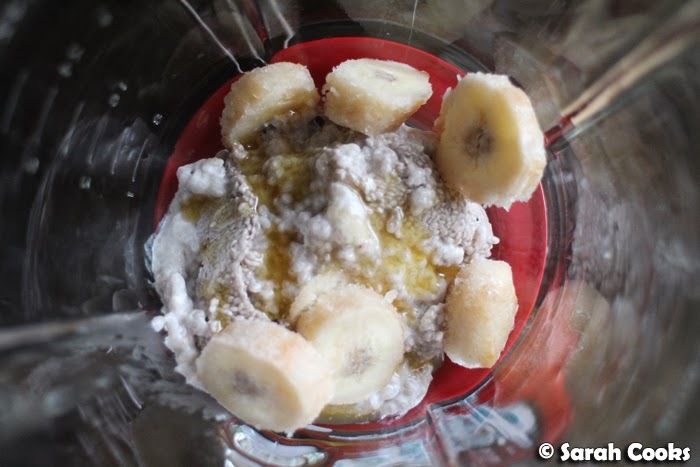 Add the frozen banana and whizz to combine. Layer up in a glass with fresh fruit of your choice. 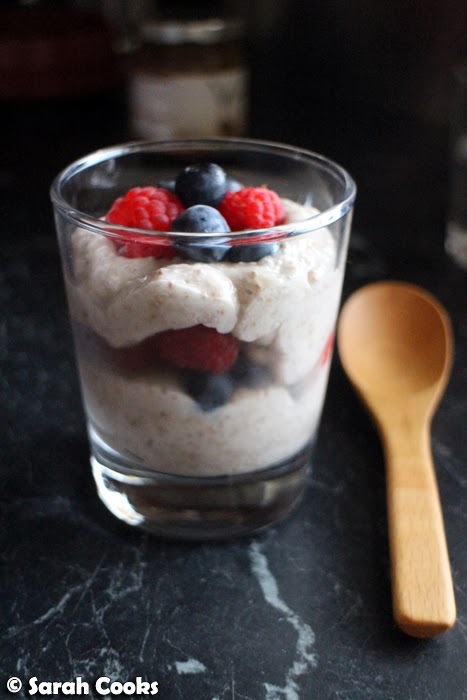 Have tried chia seed puddings made with coconut milk but I like the blitzed banana idea more. Will give this a whirl. Honey, maple syrup and agave are all just different forms of fructose, and are just as bad as cane sugar. You should try stevia if you want to really be healthy. Thanks for the comment! I'm aware that honey / agave / maple syrup are all just as calorie-dense and fructose-rich as cane sugar, and that fruit sugars (i.e. from bananas or dates) aren't healthier or lower calorie than cane sugar, but I choose to use them in my cooking even when I'm trying to be healthy because I like the taste and artificial sweeteners don't sit well with me. I've tried stevia and find it has really bad effects on my digestive system. Like seriously bad! If you want to try mango and chia pudding, try a Mango Chia Pod - I found one in the yoghurt section of Woolies! I also like soaking the chia seeds in coconut milk rather than milk as I'm going dairy-free right now.